Our clients benefit from an extensive rehabilitation program offered seven days a week. By taking advantage of specialized therapy equipment, a modern gym, and caring physical, occupational, and speech therapists, our rehab clients meet their therapy goals and go home more often than the national average. Our clinical rehab programs also offer support in managing other challenges related to aging, including urinary incontinence, cognition, fall prevention, and vision changes. Our therapists design a treatment plan to meet your individual needs with the goal of getting you home. Our nurses, CNAs, and therapists work together with your attending physician to offer a high level of clinical expertise. Your interdisciplinary team also includes social workers, dietitians, and a chaplain who take a holistic approach to healing. 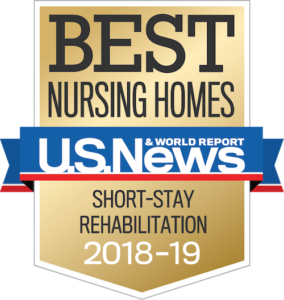 For scheduled orthopedic or neurological procedures such as hip, knee, shoulder, or spinal surgeries, the Lutheran Home offers an easy way to set up your rehabilitation needs ahead of time. Pre-registering allows you to tour, ask all of your questions, and even complete your paperwork in advance. Let us know when you are having your procedure and we will have a private room reserved for you. Contact Client Relations to pre-register, tour, or learn more.